Samsung's arrangement to surge the market with a torrent of new Samsung Galaxy A-Series mid-go smartphones is by all accounts getting almost certain as another leak reveals insight upon the specs of the upcoming Samsung Galaxy A30. 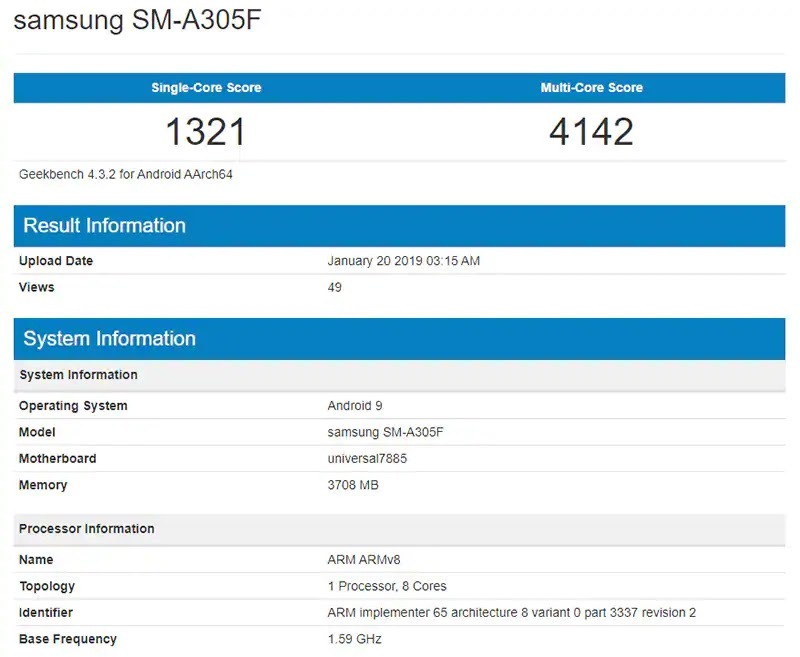 According to a Geekbench Browser listing, the Samsung Galaxy A30 would be powered by an Exynos 7885 SoC, coupled with 4GB of RAM and will run Android 9.0 Pie out-of-the container. These new specs indicate Samsung's new system of high-specced gadgets at mid-run costs to go up against the increasing Chinese challenge in this fragment. 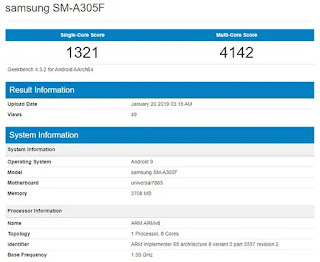 The Geekbench leak uncovers what could be the specifications for the model number SM-A305F, which would almost certainly be launched as the Samsung Galaxy A30. While not at the most premium offering in the Galaxy A-Series, the phone features some interesting specs. This includes an Exynos 7885 SoC which powered 2018's Galaxy A8 ₹ 11,099 and Galaxy A8+(Review) smartphones. As we referenced before, this SoC is paired with 4GB of RAM and is by all accounts running Android 9.0 Pie in the benchmark, which is a decent indication of that being the phone's OS out-of-the-case. The Geekbench listing was first spotted by SamMobile. It was before revealed that the Samsung Galaxy A30 will come in 32GB and 64GB storage limits, yet it's as of now uncertain whether the two variants will accompany 4GB of RAM. This adjusts well to a prior report that referenced that Samsung could be planning to launch nine phones from the mid-go series in the main portion of 2019 itself. The phones highlight model numbers SM-A105, SM-A202, SM-A205, SM-A260, SM-A305, SM-A405, SM-A505, SM-A705, and SM-A905. The new launches will be mainly aimed at Asian markets, which are probably going to include India and China, where the company is facing a high challenge from Chinese manufacturers. Additionally, all things considered, the first Samsung phone to launch this year would be the flagship - Samsung Galaxy S10 - which could be as ahead of schedule as MWC 2019 one month from now.